A noticeable fact is that whenever a laptop’s lid is closed, the system goes to sleep. The user needs to press the Power button to revive it and might need to sign-in to the device again. 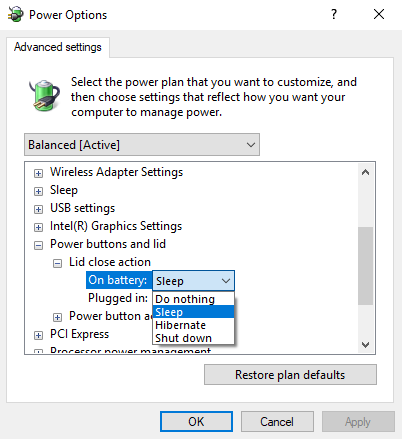 This is default setting for Windows 10 systems and the intention is to save battery when the system is not in use. However, it might not be absolutely favorable for users who might find it bothersome to sign-in to the system each and every time. A few others might need to hide their data totally by shutting down their system upon closing the lid. 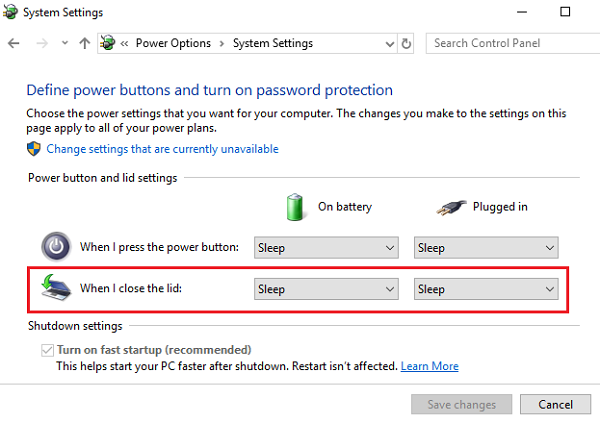 Windows 10 provides users with options to choose what happens upon closing their laptop’s lid. 1] Right-click on the battery icon at the right-bottom corner of the screen and select Power Options. 3] In the “When I close the lid section”, choose the action upon closing the lid for both plugged in and on battery states. 4] Click on Save Changes to save the new settings. 2] Click on Change plan settings corresponding to the currently selected power plan. 3] Select Change advanced power settings, and in the window that opens after that, expand Power buttons and lid. Then expand Lid close action and change the settings for both On battery and Plugged in. 4] Click on Apply and the OK. In case the above 2 methods fail, which is rarely the case, we could try changing the settings through Command Prompt. Hit Enter and restart the system.